The Bottom Line: Muslims Of America (MOA) Under Investigation As A Terrorist Organization. Muslims Of America (MOA) Under Investigation As A Terrorist Organization. As a follow-up to the previous article titled Fed To Raid 20 Year Old NY Terrorist Training Camp the U.S. Gov’t Confirms MOA Jihadi Cult Under Investigation. A U.S. government agency confirmed in a letter to the Clarion Project that an investigation into a terror-linked Islamist cult named Muslims of America (MOA) is ongoing. For forty plus years the group has been known for its terrorist ties but had been hiding behind the first amendment as a religious organization. But now with the Deep State exposed so-called “Islamic villages” in North America, with its “Islamberg” headquarters in up-state NY receiving the most attention, is finally being investigated as a terrorist organization. Muslims of America (MOA) used to be known as Jamaat ul-Fuqra when it carried out a series of terrorist attacks on U.S. soil from the 1970s to the early 1990s. The group is led by a radical cleric in Pakistan and claims to have 22 “villages” in the U.S., which are known to have been used for basic military-type training. FBI documents from 2003 released by Clarion Project earlier this year stated that the MOA is’ and was linked to al-Qaeda in Pakistan at that time. The Justice Department letter is referring to a Naval Criminal Investigative Service (NCIS) terrorism and counter-intelligence probe into MOA activity possibly impacting the U.S. military. The Clarion Project has received a series of documents from that investigation dated between 2002 and 2004, and the files confirm that concern about MOA’s extremism is warranted. The documents refer to “Islamberg” in Hancock, New York; “Ahmadabad West” and “Ahmadabad East” in Red House and Meherrin, Virginia; “Islamville” in York County, South Carolina; “Hassanville” in Ontario, Canada; the “village” in Dover, Tennessee and one in the state of Washington. Travel to and from Pakistan, Jamaica and Trinidad and Tobago is also of concern. The NCIS explicitly states that MOA is the “U.S. name” for Jamaat ul-Fuqra and that there are reports of gunfire, including automatic gunfire, at the compounds. The documents state that all locations have individuals who are involved with criminal scams to raise money for MOA/JAF,” including worker’s compensation fraud, insurance fraud, credit card fraud, illegal straw purchases of weapons and conversions of semi-automatic firearms into fully-automatic guns. MOA members send the funds to “Islamberg” in New York and/or Lahore, Pakistan for Sheikh Gilani. “MOA members from all compounds also travel to Pakistan for both religious political education as well as military-style training and operational experience fighting in the Kashmir region of Pakistan,” the document states. The declassified NCIS documents show extensive MOA activity in the state of Virginia outside of the two known compounds. The Virginia MOA compounds are suspiciously secretive. The documents recount how the compound in Red House behaved after a hurricane in 2004. They refused to grant access to the property for the local fire department and Virginia Power to fix power lines for several days. There are similar stories from other compounds. At the time of the documents’ writing in 2002-2004, life in MOA’s Virginia compounds was known to be very strict. Two families left the Red House compound after televisions were banned. Suspected MOA members are reported to travel to the area and cash counterfeited payroll business checks. They then disappear. Members also operate convenience stores in the towns outside of the compounds and were looking to buy more land at the time. According to the NCIS documents, the person in charge of the Red House compound’s security was a local Orange City Police Department officer. Seized MOA documents show a concerted effort to infiltrate law enforcement and establish security companies as fronts. Many MOA members have U.S. military backgrounds, the documents warn. 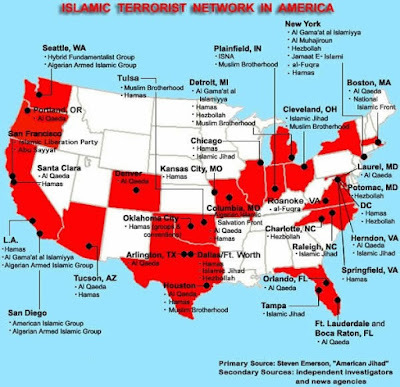 The investigators are especially concerned with MOA infiltration of Naval Air Station LeMoore and Fort Irwin in California by long-time members of the terrorism-tied Jamaat ul-Fuqra/Muslims of America group. The files refer to suspected MOA members working as a housing contract officer at LeMoore and as a contract administrator with the acquisitions command at Fort Irwin. Concern is also raised about a MOA-owned cab company that may have access to U.S. bases and services performed by a MOA member who is a contractor for Avaya Communications. At the time the files were authored, at least two “long-time members of the terrorism-tied Jamaat ul-Fuqra/Muslims of America” group were known to have worked as a housing contract officer at LeMoore and as a contract administrator with the acquisitions command at Fort Irwin. The two MOA members were from the group’s 400-acre “Baladullah” compound in Fresno County, California that was abandoned after its leaders were indicted for defrauding the state government of $1.3 million in a massive charter school scam. The money is believed to have been funneled to MOA’s leaders in Pakistan. The compound was “believed to have support terrorism,” NCIS writes. The NCIS was concerned that the MOA members were using their positions to earn “kickbacks” to fund their organization and its leaders in Pakistan. THE BOTTOM LINE: Declassified documents and the NCIS papers show that the concern about MOA has been ongoing for more than 40 years, on and off since the early 1970’s. For example, when the Clarion Project exposed a MOA enclave in Texas in 2014, the report included FBI documents from 2003-2007 with frightening warnings about the threat posed by MOA’s extreme terrorist history and international infrastructure. A retired federal source confirmed to The Clarion Project in April that he was given urgent national security briefings about MOA after 2009 with an emphasis on the group’s acquirement of weapons and tactical capabilities, including training of women and children. Yours truly wrote about this Islamic threat in 2007 and made an inquiry by email about this to the FBI, I was told to cease and desist or be shut down. Government documents are only released after they have aged. Those who contend that MOA poses no threat point to a gap in time between an incriminating investigatory file and the time of publication. However, the U.S. government’s private assessments of MOA since the 70’s have been consistent. The most up-to-date evidence from declassified files show that MOA is not the “moderate” group it claims to be. It only a matter of time when those in government wake up to the fact that there is no such people as moderate Muslims period. The NCIS referred to the MOA as a “Jihadist Cult,” now if we can just get them to read the Muslim Books they would realize that the whole so-called religion of peace is a Jihadist Cult. MOA members were subjected to a spate of arrests in New York state this year, as reported by this author and Martin Mawyer based in part on their confidential informants inside the group. As previously reported a MOA associate, Ramadan Abdullah, was apprehended with a weapons stockpile. MOA may also be feeling heat because of its long relationship and public support for Hizbul Mujahideen, a terrorist group in Pakistan and Kashmir. The U.S. State Department designated Hizbul Mujahideen as a Foreign Terrorist Organization on August 16, prohibiting any material assistance to the group. Why doesn’t the west want to know the truth about Islam? Do you want to know the truth about Islam and its history? Watch This. Do you want to understand the Islamic Agenda Master Plan Watch This.